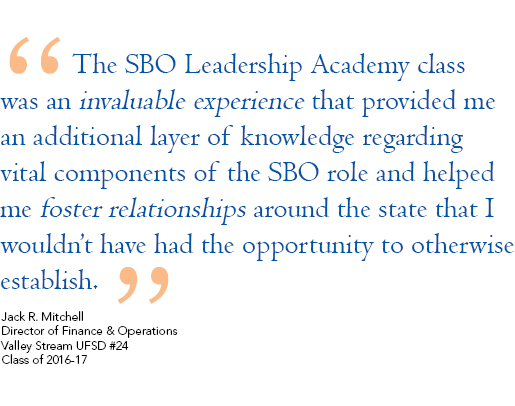 The SBO Leadership Academy is targeted to recently hired school business officials or those who are looking to move up the career ladder to become the chief SBO of a District or BOCES. The Leadership Academy will provide participants with the skills and knowledge needed to be a successful school business leader. The ten courses (48 hours), in half-day or full day increments, will be offered over a 12 month period in conjunction with current ASBO events or as a stand-alone program. Instructors: SBO Leadership Academy courses are taught by experienced school business officials, academic faculty members, specialized experts and consultants in particular fields. Applicants must be ASBO members and have at least three years of experience in a school business office or newly hired (less than two years) as the school business official in an SDBL certified or civil service position. Applications for the 2019-2020 class should be submitted by May 1, 2019, to the Association of School Business Officials of New York office at 453 New Karner Road, Albany, New York 12205. Applications can also be submitted to mborges@asbonewyork.org. Along with being one of the three sponsors of the SBO Leadership Academy, the New York Schools Insurance Reciprocal (NYSIR) supports the professional development of NYSASBO members by sponsoring attendance for one person from each chapter. NYSIR will pay the full $1,000 attendance fee for any individual a chapter selects. To apply for this scholarship, please contact your chapter president for the nomination. Scholarship applications are due April 19. Questions? Please contact mborges@asbonewyork.org. This course will provide insight and guidance on establishing positive working relationships with your superintendent, school board, and other relevant school administrators. Relationships with key stakeholders like the Board, Superintendent, principals, etc. Role-playing and case studies involved. This course will prepare participants to be effective public speakers and presenters. You will learn basic skills for communicating effectively, getting your message out clearly, and connecting with your audience. Additionally, you will learn how to create a comprehensive public relations plan from the business office perspective, including how to effectively communicate your budget or other issues to the board and community. Preparing documents and using technology to effectively deliver messages (i.e. powerpoint, online, etc). Change is inevitable! Hence embracing change is a core leadership capability, and a key driver for future success. This workshop enables individuals to build an overall understanding of the change management process, and develop clarity and depth in their role of successfully managing change. During the workshop, participants will apply practical change management tools against real world scenarios, which will help them effectively lead their team through change initiatives. This course will provide an overview of issues associated with supervising employees on a daily basis, ranging from performance evaluations to job descriptions, fringe benefits, employee manuals, and interviewing techniques. This course will provide an overview of the non-educational operations of the school district that report to the business official. This course will provide an overview of the central office’s role in providing a safe learning environment. It will also provide a guide on dealing with a crisis within your district and with the community. This course will provide an overview of state aid formulas, categories, applications, and timelines. This course will provide an overview of the educational aspects of the school district ranging from special education and common core curriculum to APPR and teacher tenure. This course will provide an overview of the strategic planning process and how to manage a project from beginning to end. This course will cover the skills and behaviors of good leaders as well as how to motivate employees, communicate a vision and collaborate successfully. This course will encompass a group discussion for conclusion and recap of the items learned throughout the Leadership Academy. It will also include a collection of resources the graduates can use in their jobs going forward. SBOLA graduates from the past are encouraged to attend and contribute.